Spots are special places for which Windfinder generates wind forecasts and weather forecasts. These places are of special interest to windsport enthusiasts such as kitesurfers, sailors and paragliders – in most cases, they are beaches where such sports are carried out, marinas, or takeoff or landing sites. There are currently over 45000 spots worldwide. What are weather stations / reports? Besides spots, Windfinder also offers a unique network of over 21000 weather stations worldwide. The current wind and weather measurements at these sites can be viewed in real time. This feature is especially useful in more complex regions or for monitoring current weather conditions at your location. We use knots and degrees Celsius as our default units. These units are often used by sailors, kiters, surfers, windsurfers and paragliders. Use website settings to switch between units at any time. For converting between wind speed units such as knots, km/h (kilometers per hour), m/s (meters per second), and mph (miles per hour), you can use our wind speed calculator. Windfinder offers two forecast models. The first is the normal forecast that is based on the GFS model of the US National Weather Service NOAA. The second is the Superforecast, which is based on improved physical and topographical models and uses a significantly higher horizontal resolution. This results in better forecasts for local conditions such as thermals and complex topography. All Superforecast values are available in hourly intervals. Keep an eye on wind and weather forecasts and measurements when you are on the road – you can instantly stay informed using our iOS and Android apps. 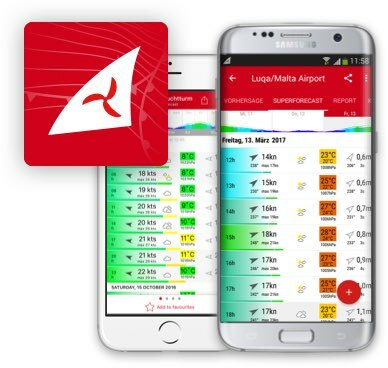 Offering customizable favorites, widgets and optimized data transmission, our apps are what you need for a perfect day out windsurfing, sailing, kitesurfing or paragliding.